In the morning we travel by car toward the Silver Waterfall where we will be able to take a short walk to the waterfall. We will then drive further to Heaven Gate, the highest peak of roads in Vietnam From thereyou can see Fansipan,the highest peak of Indochina mountains as well as enjoy stunning view of Binh Lu Valley. The trek will be relatively soft until lunchtime. After a couple of hours of hiking, we will have a break at a nice spot in the forest and enjoy a good lunch. With new energy we start ascending as well as descending towards the campsite. En route have opportunity to enjoy the scenery and magnificent views to Sapa area and beautiful landscape of Lai Chau province. We will arrive to the campsite at 2900m ASL in the late afternoon. Now it is time to relax and enjoy a well prepared dinner. After having breakfast, we climb to the top, where we can celebrate your victory. From there, we can enjoy the best view to beautiful sceneries. You will then start descending. We stop on the way at a nice spot for lunch.After lunch, we start the tough trek, which is all the way downhill through rainforest. 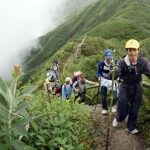 This part requires a great concentration to step on steep trail until we meet the campsite at 2700m ASL. Here we spend another night in tent. In the afternoon, we head toward Ban Ho. We will trek along Muong Bo River where we can enjoy a refreshing swim nearby a waterfall before we arrive in Ban Ho. Here we spend the last night in a Tay house. We will have chance to taste rice wine with friendlyTay people during the meal.